Hendy Farm Holidays01654 710457work FarmhouseA warm welcome awaits you at Hendy, situated in the Snowdonia National Park. Enjoy Bed and Breakfast on a working farm with the privilege of its own halt on the Talyllyn Narrow Gauge Railway! From here you can leisurely tour town or countryside. Hendy is within walking distance of the seaside town of Tywyn and its renowned sandy beach, with all its facilities to enhance your stay. These include a leisure centre, an indoor swimming pool, a cinema, many pubs and restaurants. The area is ideal for activity or leisure with numerous facilities-bowling green, tennis, horse-riding, fishing and the renowned Centre for Alternative Technology. It is also a good centre for touring mid and north Wales with major attractions easily accessible. Hendy is a family run, mixed farm where sheep and cattle are reared and the landscape is carefully respected. Guests are free to walk the 250 acres as they choose, and also to relax in the large garden which attracts various species of birds. The serviced accommodation has three spacious bedrooms all with en-suite or private facilities. Each room has its own colour television, clock radio and beverage tray. A warm welcome awaits you at Hendy, situated in the Snowdonia National Park. 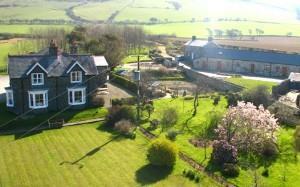 Enjoy Bed and Breakfast on a working farm with the privilege of its own halt on the Talyllyn Narrow Gauge Railway! From here you can leisurely tour town or countryside. An electric car charging point is available for guest use. Leisure centre, swimmimg pool, cinema, local pubs, bus stop, town centre within 1 mile. Free Wifi Available in all cottages and electric car charging point available. Children welcome from any age. On the A493 from Bryncrug to Tywyn turn left by 'Croeso/Welcome Tywyn' sign, left up lane and immediate left up farm drive. Bus stop on the main road. 1 mile railway station - own halt Talyllyn Railway. Written Access Statement available upon request.